0.8inch, 1.0inch, 1.2inch, 1.5inch etc. 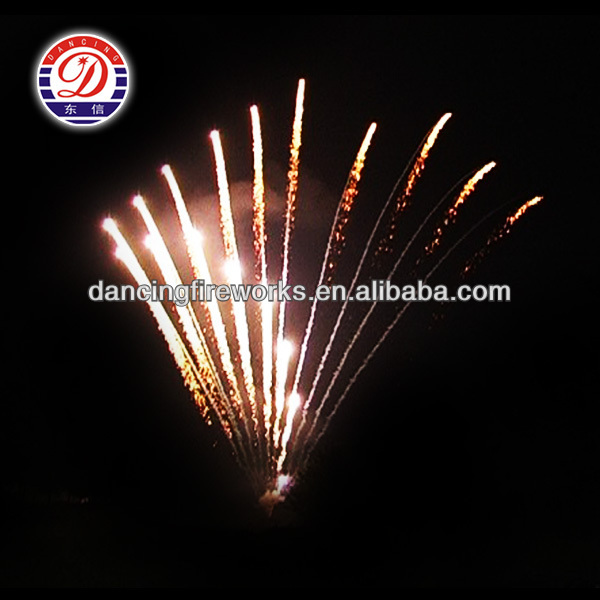 Tube Size(ID) 0.8inch, 1.0inch, 1.2inch, 1.5inch etc. Customize We can make different effect accoding to your needs. 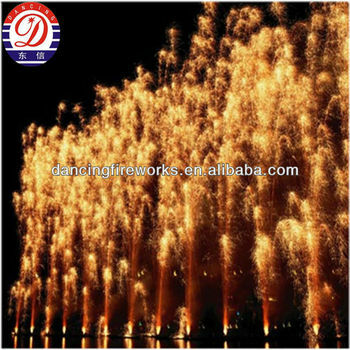 Effects: stars, glittering, chrys., peony, willow, falling leaves, flying fish, time rain,brocade cascade and more. Colors: red, yellow, green, blue, purple, silver, gold, peach, lemon and more. Shapes: Z shape,W shape,V shape, C shape, 8 shape, Fan shape and more. 100s, 110s,120s, 130s, 132s, 140, 150s, 165s, 168s, 196s, 200s, 252s, 300s, 320s, 400s, 408s, 525s, 600s, 665s etc. Pls feel free to contact me if any questions. 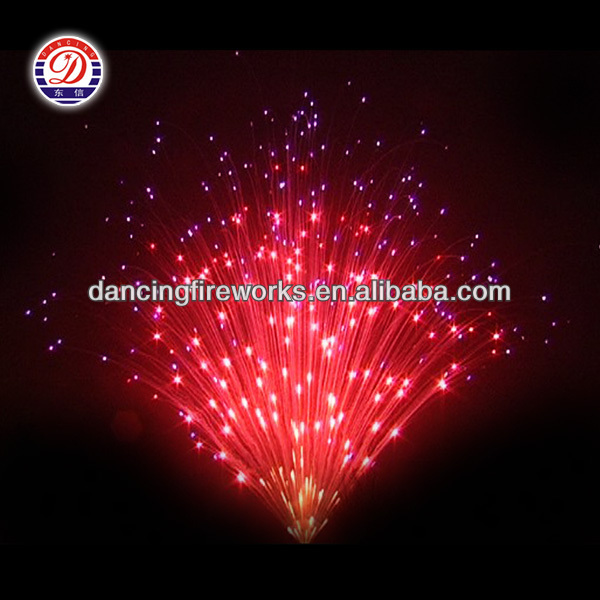 Dancing Fireworks Group, originally founded by Mr. Zhong Ziqi in 1996, was incorporated in 2004. 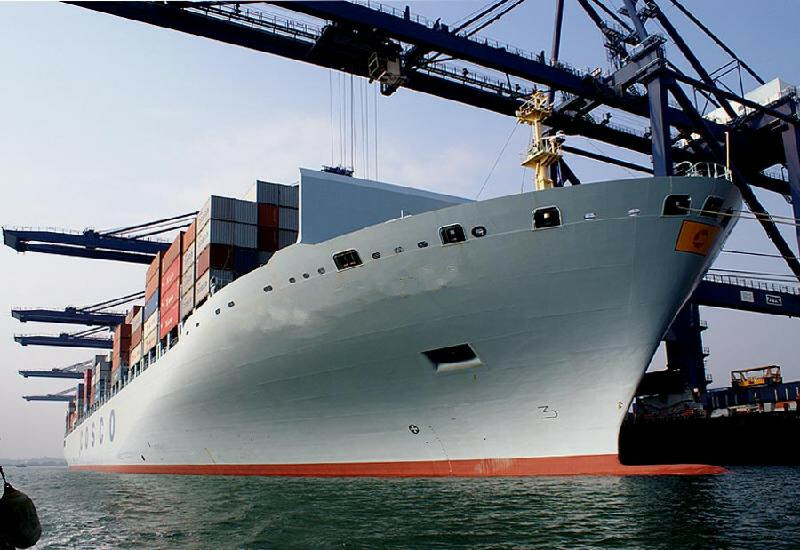 The group covers a land area of over 3 million square meters and building area of over 80,000 square meters, and employs over 1,600 well trained workers. 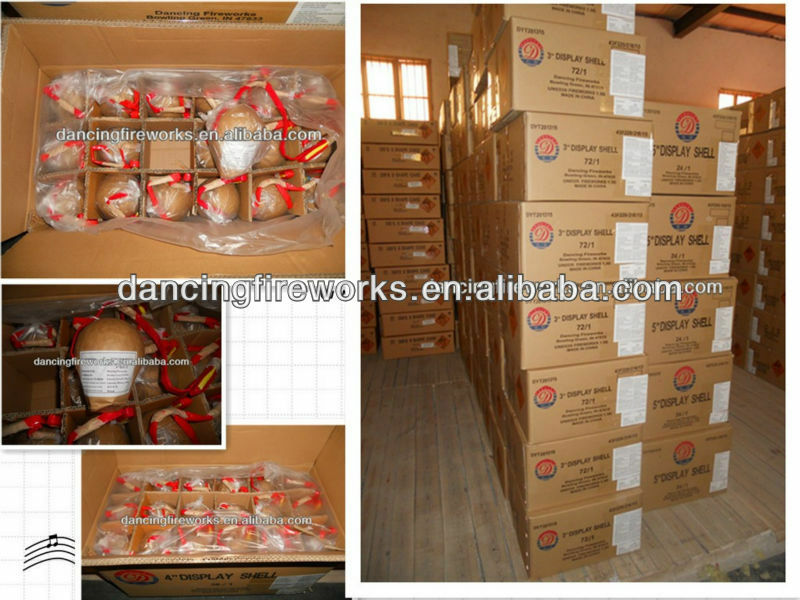 The group is a well-known large-scale fireworks group both at home and abroad, covering fireworks R&D, production, sales, raw materials, packaging and show business and has the right to export directly to overseas markets. 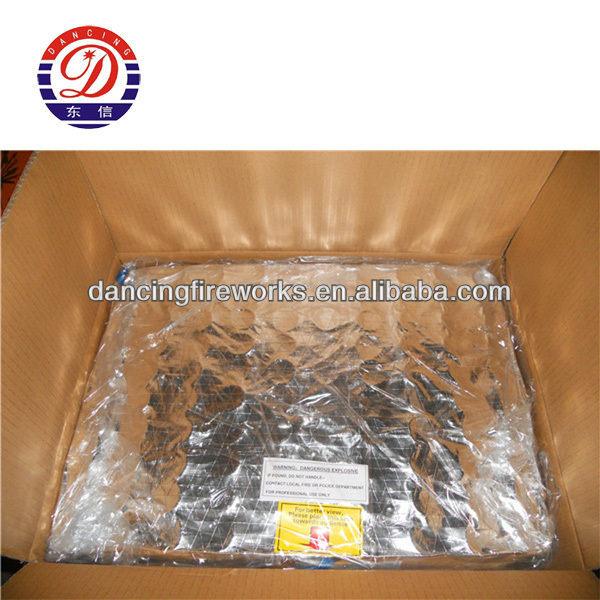 Dancing Fireworks Group manufactures eight categories, over 3000 diversified safe and environment-friendly items, mainly inclusive of fountains, spinners, barrages, roman candles, aerial shells, shelf fireworks, firecrackers, combination fireworks which enjoy high reputation from tens of countries and regions. 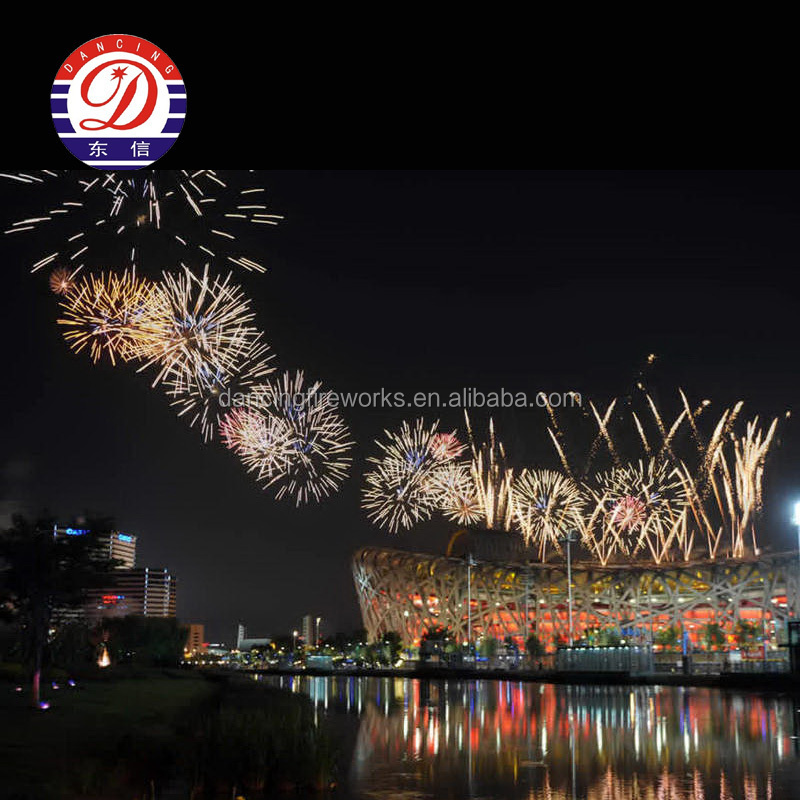 The opening and closing ceremony show of Beijing Olympic Games, the opening and closing ceremony show of Beijing Paralympics Games in 2008, the 60th National Anniversary Celebration Show of the Republic of China in 2009, Shanghai World Expo. 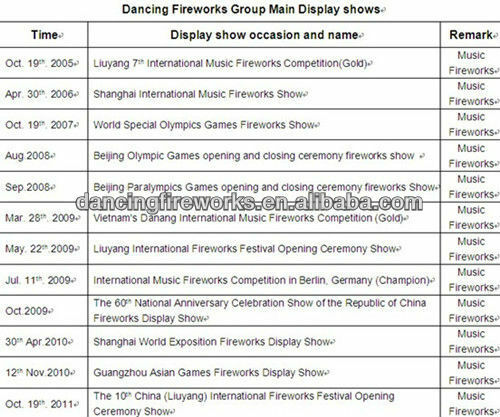 Show in 2010, Guangzhou Asian Games Show in 2010, etc., which resulted in great success and enjoys high popularities from leaders and other spectators of various countries and regions at presents. 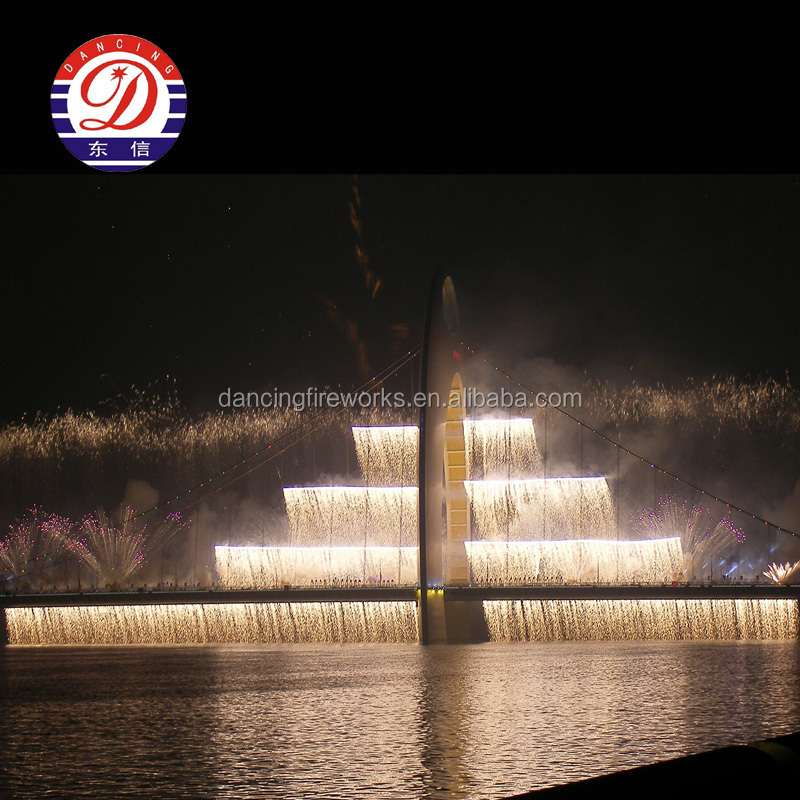 Dancing Fireworks Group considers "practicality, innovation, excellence, and trustworthiness" as the enterprise’s aim, and "harmony-oriented, good faith being supreme, the sound operation, and benefiting society" as the business concept. 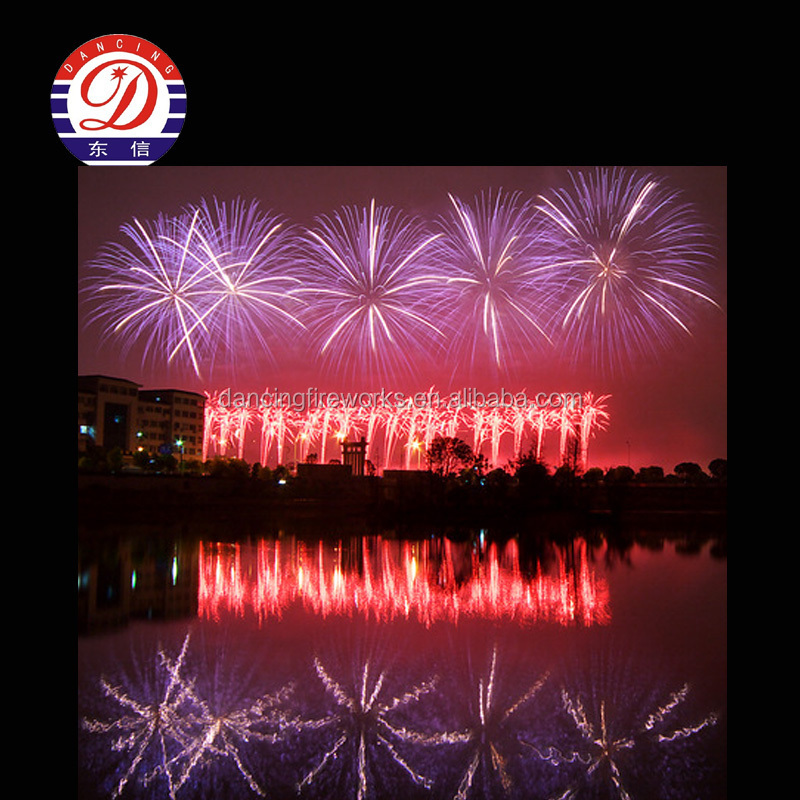 It brings hundreds of millions of viewers’ unparalleled visual feast. 1. 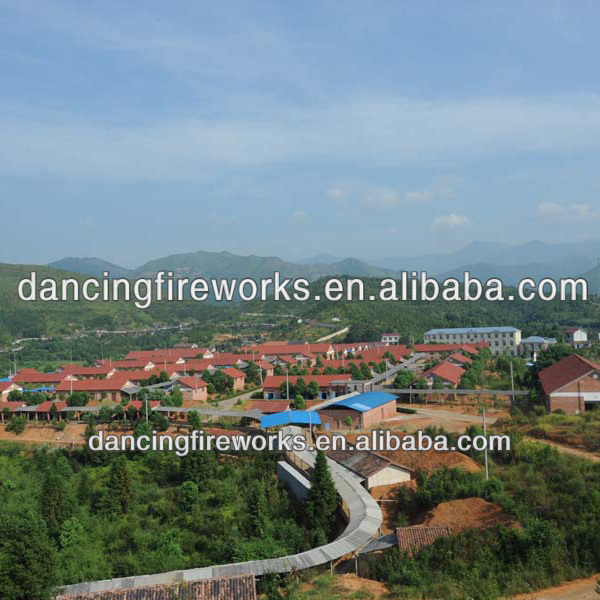 High quality, secutity, competitive price and better service. 2. 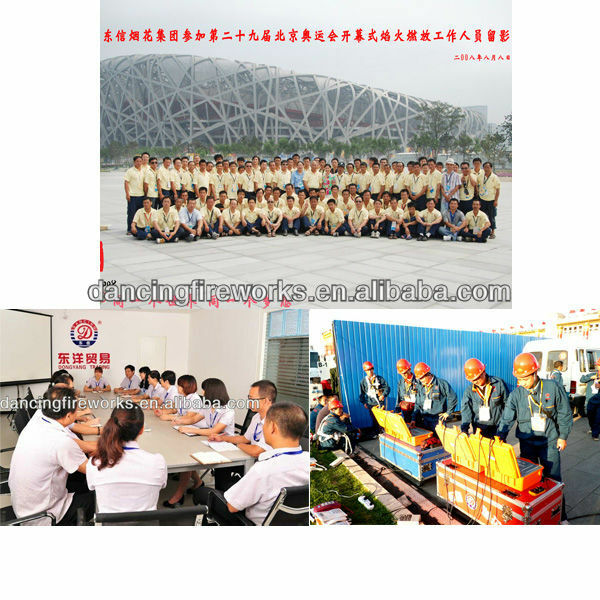 Our group has the history about 17 years and has now 11 subsidiaries . 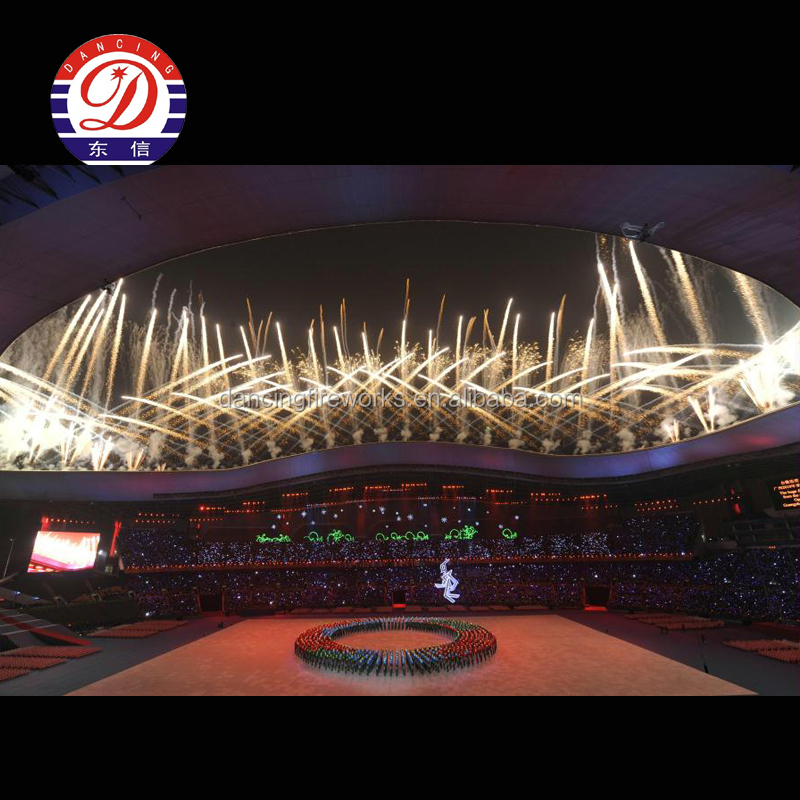 3.Beijing Olympics Show, Beijing Paralympic Show, APEC Shanghai Summit Show, World Fortune Forum Show, U.S.PGI Convention Show, Asian-Pacific City Mayor Chongqing Summit Show, Quebec Canada Fireworks Competition and Shanghai Cooperation Organization Summit Show, etc. 1. We will reply you within 24 hours. 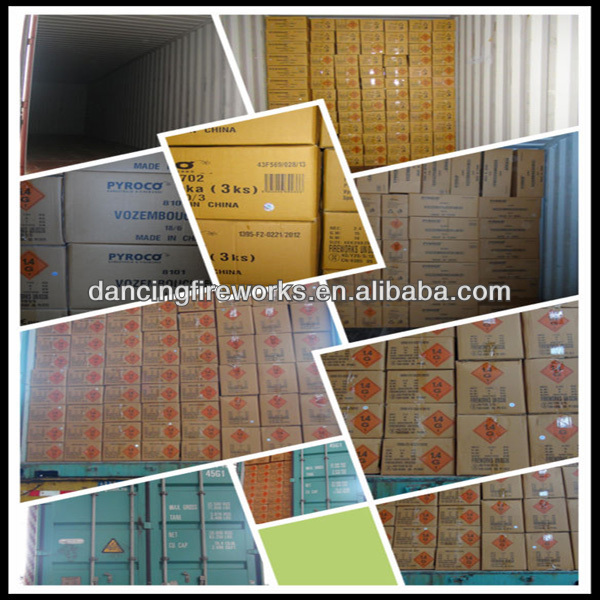 We high appreciate your any inquiry by email, fax, tradeManager, skype or telephone. 2. Technical proposal will be offered by our engineer according to your information. 3. After sales service will be offered within warranty period. 4. Full production process will be shown to you by photos & video during manufacturing. 4. Please never hesitate to contact us at any time if there are any questions.